Hope you are having a creative week too! You've been very busy! I've not done much at all. In between sick girls and dust storms I've managed to do a little bit of a sewing (quilt) for my new niece, and that's about it. 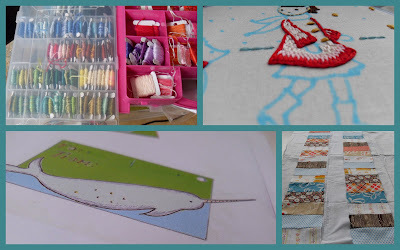 Seeing your embroidery there makes me want to get my needle out tonight though - love it! Amy, it's going to be quite colourful, I just used my hand dyed fairyland floss for the girls scarf. And now I think Hedgie needs a rainbow scarf too!